Ochratoxins, a group of dihydroisocoumarin-containing mycotoxins (Figure 2), are produced by a number of fungi in the genera Aspergillus and Penicillium [reviewed in Bhatnagar et al. 2002; Chu 2002; Ono et al. 1995; Petzinger and Ziegler 2000). The largest amounts ochratoxins are made by A. ochraceus and P. cyclopium. A. ochraceus and P. viridicatum (reclassified as P. verrucosum), two species that were first reported as ochratoxin A (OA) producers, occur most frequently in nature. Other fungi, such as Petromyces alliceus, A. citricus, and A. fonsecaeus (both in A. niger group), have also been found to produce OA. Most of the OA producers are storage fungi and preharvest fungal infection and OA production is not a serious problem. Although most OA producers can grow in a range from 4°C to 37°C and at aw as low as 0.78, optimal conditions for toxin production are narrower with temperature at 24-25°C and aw values > 0.97 (minimum aw for OA production is about 0.85). Ochratoxins are produced primarily in cereal grains (barley, oats, rye, corn, wheat) and mixed feed during storage in temperate climatic conditions, with levels higher than 1 ppm being reported. OA has been found in other commodities, including beans, coffee, nuts, olives, raisin, cheese, fish, pork, milk powder, fruit juices wine (Filali et al. 2001; Pietri et al. 2001), beer, peppers (Thirumala et al. 2001), and bread (Van Egmond and Speijers 1994). OA can be carried through the food chain because of the presence of OA residues in animal products as result of its binding with serum albumin. Natural occurrence of OA in kidneys, blood serum, blood sausage, and other sausage made from pork has been reported [reviewed in CAST (2003)]. Figure 2 Structure of the ochratoxins. These metabolites form different classes depending on the nature of the amide group (a-c), and the presence or absence of a chlorine moiety at R2 in the phenyl group. 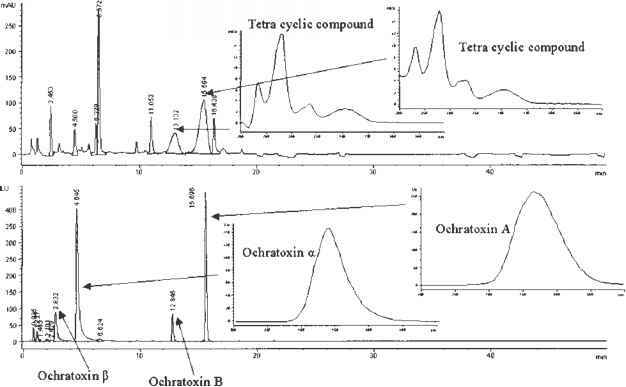 Ochratoxin A, the most toxic member of this group of mycotoxins, has been found to be a potent nephrotoxin causing kidney damage as well as liver necrosis and enteritis in many animal species [reviewed in Bhatnagar et al. 2002; Chu 2002). Although OA is primarily considered a weak nephro-carcinogen because a high level of toxin and an extended period of exposure are necessary to induce the tumors, it also causes liver tumors in rats (Boorman et al. 1992; Schlatter et al. 1996). The OA is also an immunosuppessor (Bondy and Pestka 2000; Boorman et al. 1992; Simon 1996) and has teratogenic, mutagenic, weak genotoxic properties (Dirheimer 1996; deGroene et al. 1996). Several mechanisms have been postulated for the mode of action for OA (Chu 2002). Whereas OA-DNA adducts have been found in kidney, liver, and several other organs of mice and rats, their structures and functions have not been defined (Grosse et al. 1995; Pfohl-Leszkowicz et al. 1993). Formation of a reactive intermediate such as of those for AFB1 is less likely to be involved in the action of OA (Gautier et al. 2001a, b; Zepnik et al. 2001). The OA inhibits carboxypeptidase A, renal phosphoenolpyruvate carboxykinase, phenylalanine-tRNA synthetase, and phenylalanine hydroxylase activity. Formation of free radicals has been considered as one of the mechanisms for the carcinogenic/toxic effects of OA (Baudrimont et al. 1994; Gautier et al. 2001a; Hoehler and Marquardt 1996; Rahimtula et al. 1988). Studies on the OA induced apoptosis revealed that it interacts with distinct members of the mitogen-activated protein kinase family, e.g., c-jun amino-terminal-kinase, which can lead to direct or indirect caspase 3 activation and subsequently to APT (Gekle et al. 2000; Schwerdt et al. 1999). OA may impair cellular Ca2+ cAMP homeostasis. In the renal epithelial cells, OA interferes with hormonal Ca2+ signaling, leading to altered cell proliferation. Although the role of ochratoxins in human pathogenesis is still speculative, the pathological lesions of nephropathy in humans were reported to be similar to those observed in porcine nephropathy (Krogh 1976). Outbreaks of kidney disease (Balkan endemic nephropathy) in rural populations in Bulgaria, Romania, Tunisia, and the former Yugoslavia has been associated with OA (Maaroufi et al. 1996; Wolff et al. 2000).